5/28/12 - Well I guess we're behind - so here's the latest releases of "Artisans Quraterly Review"
2/20/11 - Artisans Quarterly Review Vol 4 Issue 1 is now released. 3/6/10 - Artisans Quarterly Review Vol 3 Issue 1 is now released. 12/6/09 - Artisans Quarterly Review Vol 2 Issue 5 is now released. 9/23/09 - Artisans_Quarterly_Review_Special_Eddition is now available featuring Artisans of the Valley's international television debut! The full crew, the projects shown on the broadcast episode, and more details about our affiliate artists as featured! 8/20/09 - Artisans Quarterly Review Vol 2 Issue 3 is now released. Announcements about an international TV debut as well as several artist and project features! 6/13/09 - And now begins our quest to become W3C compliant - please be patient the site will be going through some background changes. This will likely result in a few mishaps; please report any dead links or weird looking pages. We'll do our best but given the scope of this entails multiple (dozens, 100+ in some cases) changes to minute details of every page on the site there are bound to be some errors. We thank you for your patience - this is an absolutely necessary step to evolve our site and maintain our SEO rankings. 4/27/09 - Artisans now has a new blog site: www.artisansofthevalley.com/blog you can also follow our latest updates by following us on Twitter! Simply visit http://twitter.com/EricMSaperstein and start following Eric! 3/20/09 - Artisans Quarterly Review Vol 2 Issue 2 is now released. This is a special feature release illustrating some of our affiliated artists, two special causes, and of course some of our projects. We're also featuring some of our green related details. Check back in the next few weeks our blog will be coming online soon. We just bought new dedicated webserver. There's going to be lots of upgrades and new features on our website throughout the year. We'll also be spinning off an architectural elements website this year! 2/16/09 - Artisans Green Notes - A new feature article describing our part for saving the environment! Shiloh Prairie - A new feature article illustrating a hand carved pannel featuring a custom made Shiloh Sharps rifle. 1/10/09 - Artisans Quarterly Review Vol 2 Issue 1 is now released. This issue has a lot of announcements about our referral program, marketing, new architectural elements line, CD portfolio, etc. We're also starting to feature more "Green" articles. Lots happening that hasn't hit the main website yet! A ChipChats feature article is now available of Whitetail Sunrize. Check back soon we'll be doing a lot of updates discussing green restorations and reproductions. We're going to be adding our architectural line to a new website spin-off soon, and adding our maintenance products to the main website. There's a lot pending - just a matter of time to implement it! 10/11/08 - Artisans Quarterly Review Vol 1 Issue 4 is now released. 10/5/08 - The Shiloh Display Buffalo Panel is Done! Keep and eye out - Artisans Quarterly Review Vol 1 Issue 4 will be out very soon! 8/24/08 - The Mini-Portfolio received a face lift and some additional pieces including or New Wave Gothic Server & Corner Units. Lots of photos are being improved, cropped, and enhanced. To much to list, just poke around we're sure you'll find them. Hints include the gaming table, perhaps some chainsaw carvings, the english library, etc. There will be a lot more photo updates coming soon! 8/8/08 - Artisans Quarterly Review Vol 1 Issue 3 is now released. New Publicity - Eric's feature profile in Metropolitan Life's "MetNews Daily" entitled "Artistry That Goes with the Grain." A few new and improved Pie Safe Photos are now online. 6/22/08 - Check Page 3 of our Eclectic Restorations for a new feature "Spinning Wheel" and a plaster Abraham Lincoln bust restoration. 5/29/08 - Tiki Time - 2008 check out a whole batch of colorful new chainsaw carved tikis in our Chainsaw Totem & Tiki Pages. Also check out a few new Chainsaw Bears, one more Frog, and a new Red Tail Hawk and Parrot Carving in the Birds section. 5/21/08 - Four new articles are now available, soon to be linked into their proper section, they are now floating in our documents section. All four articles are submitted for publication in the NWCA's Chip Chats. We'll keep you posted on when they arrive in print. There are several more article format features pending completion shortly. Keep in mind - these are also "draft" format as far as the web is concerned. We're planning to make these articles interactive with working photo links and such at some point - we won't say soon as that's just not likely to happen. "Whitetail Sunrize" - This is a feature article on one of our wildlife panels completed as Ted Nugent's 58th birthday present. "Jeffrey Got a Bite!" - This is a caricature carving, featuring a fisherman and his lucky catch of the day. "The Spirit of Timberlane" - A retirement gift from a teacher to his students and colleagues, a life size Timberwolf. "Carving Out a Safari" - A solid cherry "safari chest" hand carved with panoramic wildlife scenes. 5/1/08 - Artisans Quarterly Review Vol 1 Issue 2 is now released. We added the image of a completed cherry kitchen set into our modern furniture refinishing section. 4/27/08 - Photos of the completed Gothic Desk are online as well as the startup of another gothic commission (Server, Corner Units, and Dining Table) in walnut. New Restoration Pages are coming online - still empty shells, but soon they will show examples of pieces completed requiring upholstery or rushing & caning. The frames, carvings, veneer, and finish were restored by Artisans of the Valley, while the rest of the skills required to complete a full restoration were supplied by our affiliates. 3/18/08 - Introducing our "Mini-Portfolio!" Artisans finally has a printed booklet to feature our commissions and restoration work. Please feel free to download and print this portfolio! 3/2/08 - Check out Eric's feature on Browning's Trophy Case ... shown in our Texas Road Trip 2006 section and on Eric's Profile. Artisans finally kicked off our much anticipated newsletter! To subscribe please submit a a request at the following link: Artisans Newsletter Subscription. Check out our Wildlife Carvings section and view the newly enhanced images. I guess part of 2008's goal is to revisit a lot of the detail photos on the website and publish updated versions. Keep checking this page, we'll highlight some of the enhancements as they come online! 12/29/07 - Finally! ... The Texas 2006 Photos are online! The dragon bench we completed this summer is now featured in our Modern Furniture Section. More detail photos of Stanley's 1997 flower carving now appear in our Random Artistic Works. Check out the new "Pig Roasts" section in our adventure album, "updated" with some photos from 2002 - yes ... in 2007 ... so what we're behind a bit!? Visit our Wildlife Carvings Page 2 & Built-in Bars Page 2 for a series of photos featuring Eric carving a buffalo panel shot for "Master of the Shop" October � 2007 Princeton Magazine / North Jersey Media Group. Check out this recent article featuring Eric Saperstein of Artisans of the Valley. Check back shortly for some close up features of Eric's bar, also taken during this professional photo shoot. In 1988 - Eric's hand was featured in a Flemington Democrat article showing off craftsmen at Howell Living Historical Farms. Check Eric's Profile Page 2 for a glimpse of past ventures. 12/27/07 - The medieval photos are coming! These are the photos from our gothic table photo shoot featuring one of our 2007 portfolio projects. We've also added a few more detail photos of the latest gothic table photos. What else is new, lets see - a toolbox to humidor conversion joined our Eclectic Restorations. 12/2/07 - A new Project Status Page is online to help our customers keep tabs with active projects. 11/24/07 - Two completed antique radio restorations are now featured in our Eclectic Restoration Section - Page 3. Upon posting these new photos - we realized we never put up finished photos of an antique wicker baby carriage. Thus - we posted those as well! 11/16/07 - Some Road Trip 2007 Photos are available now! Check out a new Cherry Bellows in our Period Furniture Accessories section. Random Artistic Carvings now features a rosewood walking staff with an Asian piercing appliqu�. Check in soon - there will be a completed antique radio restoration online shortly! Don't forget - Artisans offers radio component restorations through Nick Senker. More on Nick will be featured in the radio restoration article! 10/13/07 - Check out our latest publicity an article featuring Eric Saperstein entitled "Master of the Shop" and a feature article announcing the opening of the new Whitman Collage at Princeton University - this article shows an image of the architectural 3D carving of a shield completed by Artisans of the Valley & Custom Creations. Additional in progress photos of a 1904 Victorian Bedroom Set restoration were posted on Page 1 of our Victorian Restoration Gallery. Start checking Road Trip 2007 - in our Adventure Albums section for updates on our pending delivery run to St. Paul, MN. 9/27/07 - We've now completed a cherry hamper - a sister piece to the oak hamper of 2002. We're now featuring hampers in our Eclectic Chests Section. A few more update photos of the Gothic 2007 project are posted, and more will follow shortly. A new name plaque with a custom carved wreath is shown in our Signs, Awards, & Displays section. 9/25/07 - We've posted a few hints of a very unique project to create five original gothic stair posts in our architectural carvings section. This project is now profiled on Architectural Carvings Page 2 including shots of the installed but still unfinished posts. We'll post the finished photos as soon as they are available. 9/16/07 - The completion of "The Spirit of Timberlane" a combination chainsaw and hand carved timber wolf is now featured in our Chainsaw Carving Demo page. Our Architectural Carvings page shows off the Princeton University shields in a feature article published in The Times. 7/28/07 - OK - a few more updates off topic from woodworking but providing some general background. We added an Adventure Album to the Company Background Section. 7/21/07 - We're planning to work on some website updates over the next few weeks and get caught up with photos and projects. Of course it is likely this plan will get skewed due to the current workload. We'll do our best so keep checking back to see what's new! There's now a finished photo of a carved victorian chair with upholstery, plus another example of a chair frame restoration in our Victorian Chairs Restoration Section. A new parts replacement example featuring a cherry desk shows an example of reattaching and replacing legs. The Piano Desk is finished - Shown on Victorian Page 11. 7/18/07 - Artisans is now embarking on a 2007 Gothic Table Summer - we'll be profiling two new gothic table projects as they progress from lumber to finished pieces. Check back frequently, we'll be updating this page as often as possible. Artisans is now offering a full line of commercial sign options! Check Signs Page 3 for details, and check back soon for more feature projects! A few new features on our Signs Pages including a Gandalf Door Knocker, and a nearly complete antique phone mounting plaque. New unique restorations include an antique chess board in our Gaming Restoration section Page 2. Another two new bible boxes show off more carving patterns on our Boxes Page 1. We have more than even our usual eclectic array of projects in progress. Check back soon to see a feature custom solid oak stair post project, CNC carved wooden name plaques, custom oak wall units, another antique radio, a life size howling wolf carving, several new signs, and dozens of other projects now in the shop. 5/29/07 - We added a new "wedding chest" featured in our box section. There's a new spoon in our random artistic works. Artisans and Custom Creations finished a project for Princeton University to replicate ten unique solid oak shields shown in our architectural carvings section. 5/21/07 - It's been too long since we have updated our website, but we have an excuse. The excuse is - we've been swamped! We have an amazing array of projects that have been in progress and completed in through 2007. We're going to begin an effort to post our recent projects, as well as develop new sections to extend our services into some new areas. Our Military Artifacts Restorations now include Military Artifacts & Equipment. Believe it or not, we decided we will be offering on-site services to perform minor restorations on stationary military equipment and monuments. We recently completed a much needed painting for an M60A3 Tank. 1/5/07 - Check our Large Scale Carving section for a life size toy soldier based on the 1903 Babes in Toy land film character. Gaming tables are a great addition to any room in any style home. This current project will be a very unique piece, an original design solid walnut coffee / chess table. This piece will obviously feature a chess board as a prominent portion of the tabletop, the case will house compartments for the chess pieces, storage drawers for remotes, magazines, wine, glasses, and perhaps some hidden compartments. Check out the Safari Chest nearing completion in our wildlife carving section. Recent restorations include a flame mahogany bedroom set that we can't even describe without showing the photos. We have over 60 restoration projects in the shop now in various states. Keep checking back, new profiles will be featured as time allows. We'll soon profile another carved box, featuring a beach scene and a carved elk scene. 12/17/06 - We are WAY overdue for website updates - one is included right now with A LOT more to follow due to the gap of several months. We have been extremely busy the past few months, so check back frequently for new updates. Right now - check our wildlife carving section for a project featuring "Whitetail Sunrize," a one-of-a-kind carving delivered to Ted Nugent for his 58th birthday along with a personalized walking staff portraying his life and achievements. Check our Wildlife Carvings section for the first photos! There will be a lot more updates to follow! 8/6/06 - Again with the expansion of our services, Artisans is going to extend our onsite services to include Corrian, Stone, Marble, and Granite polishing and dressing. Check our Cleaning & Scratch Removal. 7/19/06 - A new service is available! Artisans is now offering onsite furniture and woodwork Cleaning & Scratch Removal. This service includes restoration of nicks, bangs, scratches, dents, dings, chips, and other damage to your modern and antique pieces. 7/7/06 - Check our cupboards section completed photos of a solid cherry pie safe project. 7/2/06 - Check our cupboards section for a solid cherry pie safe project, and a new completely original project a "Chessboard Coffee Table." in solid walnut. 6/30/06 - Finish photos of the box are up, well for a while now, as it has been shipped to Key West to fulfill its destiny! The Camp Olden Page of our Museum Affiliations now features two monument dedications. Completed photos of the Golf Course Signs are now online. 4/16/06 - The ongoing box story continues - There's now a peg tray for necklaces and bracelets, the base is stained and permanently fixed in place, and the tung oil is being applied. We're also making a custom packing crate to ensure the safe transport of this project! Also check on our Victorian Restoration Gallery Page 10 & Page 11 for a few updates on a secretary and two table restoration projects. 4/15/06 - The box saga STILL continues - showing the tinted panels and rose, the feet, attaching the base, and some finished trays! Stanley has a new feature in the educational section, a Civil War Living History Class. 4/13/06 - The box saga continues - now featuring the assembled sides and fitted lid and base. Wait for feet, tinting, and the rose carving! Also joining the ranks of complete is the antique trunk in our Antiques Gallery Page 4. 4/11/06 - Another door project, this one is a hand carved original solid oak double door; featured in our Eclectic Restoration Gallery Page 2. The jewelry box project is progressing in our Boxes section ... and we have a ton more updates on projects we haven't had a chance to get online yet. Check back in the next couple weeks. The trunk will finish, the jewelry box will be done, the door will progress, and lots more! 4/9/06 - Updating the Jewelry Box project to include photos of the carving features, two more modern restorations, and installed photos of a new window surround unit. Also, the Victorian Setae and Chair Feet are finally complete in our Parts replacement gallery. 4/8/06 - Finally - some layout basics applied to the Gothic Table project with additional text. We'll expand this more as soon as we get a chance. 3/28/06 - The addition of a Spindle Back Bench to Victorian Restoration Page 11, completion of the knights coloring project and a few more restored pawns on our Gaming Restoration Page, and a country cedar sign. Also now featured will be the progress of a hand made jewelry box. 3/25/06 - Another coffee table project begins in the Antique Gallery Page 5 , A Salt Chest project in the Victorian Section Page 11, Completion photos of the Jaques Club Set Restoration, More Civil War Soldier Monument Photos. 3/24/06 - The 2005 Swiss Trip Section Expands to include more pages and lots more photos! 3/22/06 - Completion of another Sewing Table, Modern Coffee and End Tables, Stool Restoration, Victorian Coffee and End Tables. 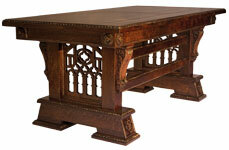 The addition of a Bridge Table and Cradle to our Victorian Gallery - before photos as the restorations begin. 3/18/06 - Additional progress photos to our Victorian Chair & Setae Project, a Window Surround in progress in our new General Built-In's Page, and the first 4Wheeler Photo on the New Rig page. 3/12/06 - Victorian Restoration Additions! Two new pages (10 & 11) plus updates to several other pages. More coming through later tonight and this week. Updates featuring tables, dressers, mirrors, secretaries, and various other projects. The Trip Section now has a more detailed article on Stanley & Cindy's 2005 Switzerland Adventure ... photos will be coming online soon! Updates to our New Wave Gothic Entertainment Center Feature - a few more photos and the High Resolution Versions of the finished piece. We did some 'minor' improvements to our Saw Mill Tour, mainly putting the photos that have been sitting around on the web server online. Look for more photos of the soldier monument and the buffalo panel if the weather allows soon! We also have some additional projects coming in shortly for restoration. In addition - we'll be featuring the pattern development and progress photos for a unique hand carved box, recently commissioned, in the near future. 3/9/06 - More and more bug fixes, typo's and all that good stuff. A few photo additions to Eric's Profile as well as the "New Rig" section. 3/7/06 - A whole bucket of bug fixes - finding mismatched photo links, typo's, cleaning up the HTML ... etc etc ... This project will continue for a while to hopefully eliminate some minor annoying issues. The Swan Restoration - was added to the Eclectic Section. Completed photos of another Walnut Drop Leaf table restoration project are in the Victorian Section. Another Mirror in progress, addition to the Victorian Gallery Page 3. A new Solid Oak Custom Cane Rack - addition to our Period Accessories page. 3/2/06 - A few more typo's are fixed. The Parts Replacement section is now split into two pages with the addition of a clock molding restoration. The Beer Wagon restoration is complete in our Eclectic Restorations. A Walnut Drop Leaf table was added to the Victorian Gallery Page 5 in an "In Progress" state. 2/26/06 - Fixing a mess of typo's and such. Please let us know when you find broken links, typo's, or anything else that doesn't look right! 2/23/06 "2005 Switzerland Trip " Another new section underway! Stanley and Cindy's 2005 Switzerland trip, a woodcarving tour by Chestnut Tours, guided by world famous carver Wayne Barton. This is the first page of many to come, we have over 1000 photos to process and build a gallery with a wealth of woodcarving details and information! Keep checking back as this section grows. Company Background - Natural Habitat, check in for spin-off into profiles of Eric M. Saperstein and Stanley D. Saperstein. We'll be expanding these sections as time allows to include lots more of our "outside of woodworking" lives. In our Woodcarving & Sculpture section the Large Scale Sculptures are split out into feature pages. Check back soon for updated photos of the civil war solider monument. 2/9/06 "Chainsaw Carving" An entirely new section featuring Master Chain Saw Carver Bob Eigenrauch. 1/24/06 - More signs, so many signs that we split into two signs pages! Check back soon, we're working on a few of them now and the in progress shots are now online! 1/22/06 - Check our Restoration Gallery pages have been updated to include completed photos for the legless dresser on our Victorian Gallery Page 5. There are several new pieces coming in for restoration through 1st Quarter 2006, many are featured as "before" photos on our Restoration Gallery Home Page. We started work on a window surround unit, check back soon for updates and in progress photos on that project. 1/15/06 - Check our Restoration Gallery pages for new projects. In progress profiles include a sewing table, a legless dresser, a Louis XV (circa 1750) dresser leg reattachment, a candle stand, a shipping trunk, and a few other projects. 1/8/06 - The first updates for the year are simple and mostly background. I fixed many of the meta titles so you'll notice your browser more accurately reflecting the title of what page you are visiting. We also re indexed the site accordingly. Addition of a new custom unit, collaboration with Custom Creations in the bookcases section. There are now some shop photos up, including our hardware warehouse and carving studio. An in progress Victorian Bar Unit, Victorian Sewing Table, and a recently Completed Circa 1860 Dresser were added to our Restoration Gallery. An in progress "Magic Circle" sign is now in our signs section, check back soon for finished photos. There is Lauenbrau beer wagon, in progress, in our eclectic restoration section. Our Random Artistic Works section now features "Golf Ball Screamers" - find out what little creature is inside your golf balls! Stanley's latest museum project is taking shape in our Large Scale Sculpture section. This project will create a scale model Civil War solider for a park monument. Check back shortly for some updates of our recent restorations. We have several projects in projects and a lot of new ones pending! 12/26/05 - The Xmas gift signs are now online in our Signs section. The addition of several new links into our various Affiliate Links pages. Check in shortly photos of a simple solid quarter sawn oak mantle. There will be progress shots coming on a new window surround wall unit. We have lots of restorations in progress including dressers (one Circa 1750) a mahogany bar unit with extensive carving, a sewing table, a batch of chairs, and several other endeavors. 11/9/05 - Updating the format of the home page to provide a little more detail about just who we are and also provide easier to manage feature links to show off specific areas of our website. We are also updating our Alt tags and other background details on the site. Pages may show up new, but will not reflect changes visible to normal browsing in such cases. 11/8/05 - A new music box for the custom boxes session, an original by Stanley Saperstein. 11/4/05 - The Entertainment Center is done! Featured now on our home page, as well as our Period Furniture Bookcase and Built-In Entertainment Center sections. 10/29/05 - Posted the Gothic Entertainment Center project on the home page. Added new photos of this project in our Period Furniture Bookcase and Built-In Entertainment Center sections. 10/19/05 - Long overdue is a Website Update page update! Restoration Gallery - Our restoration gallery expanded a great deal in the past year. Dozens of new feature projects are included and the section broke out into multiple features including: Antiques, Artifacts, Carriages, Eclectic, Gaming, Golden Oak, Military, Modern, & Victorian. Our Educational Services expanded to include Resource Links and features on Stanley's Novel "Sharpshooters"
Period Furniture now features our 2005 Portfolio Project, a Gothic Dining Table and a Gothic Entertainment Center in Artisans "New Wave Gothic" theme. Architectural Carving is a new addition to our Woodcarving & Sculpture section along with several new and interesting projects including Eric's Buffalo Panel in our Wildlife Carving section. Our Commission Process now features a more descriptive process, and breaks out our formal Restoration/Commission contract. Our Museum Affiliations now include The Holcombe Jimison Farmstead. Check in soon for some projects we're working on with this new affiliate. We finished a built-in project for Mechitza dividers featuring a one way viewing canvass, shown in detail in our Religious Furniture Section. A host of new Walking Sticks are showing in our galleries, now split off to www.customwalkingsticks.com. Our Affiliate Links broke up into several sections, in an effort to make our relationships more defined and useful to our clients. 4/23/05 - It's a lot to explain - we now have the first spin-off site (www.customwalkingsticks.com) and we've added a ton of photos in our conservation galleries. The wood catalog continues to progress. We've been incredibly busy in the shop and haven't had much time to complete a lot of our educational section updates. 9/1/04 - Our SHTML conversion is beginning so you will find some re-directs on old links. Starting with the Restoration Gallery! This will test how the search engines react; hopefully we won't loose to much traffic. Lots of new restoration projects will be added as we renovate the pages. 8/10/04 - We added to the home page, a few more links to publicity, articles, etc. 8/3/04 - Check for a list of updates shortly! We're back in business after Eric's laptop crashed! 4/4/04 - We're continuing our expansionist methods, We may even be adding a few new .Com's soon! Unfortunately have not yet converted to SHTML or PHP to date. However, Artisans of the Valley now resides on our own private server. We are offering host services to many of our affiliates at this time and plan to continue to expand this effort as a sideline to cover the costs of our website. We should also note, we spell checked the entire site. We're always doing quick updates and sometimes Eric's horrible spelling skills prevail! 03/31/04 - Many updates in progress to be listed shortly! Lots of updates keep flowing - however the major overhaul to a more dynamic configuration is still pending. A new section on American Architecture has been added, as well as the shell of a wood catalog and bookstore. The first wave of back end changes are done, but there's a long way to go. Did you notice anything changed? If not, good that's what we wanted it's all just for future upgrades and maintenance improvements. Please note, we're beginning some back end site renovation work. If we do our job, you won't even notice most of these changes. This effort is preliminary for a major upcoming renovation and expansion this winter. We would greatly appreciate reports of any dead links or problems with our website. Ease of access and customer satisfaction with the navigation and content of our website has become critical to our business, we will investigate all reports right away! Thank you!